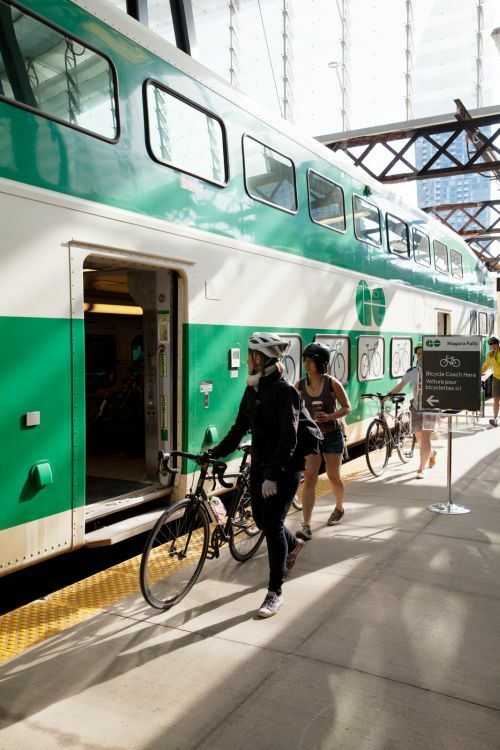 Bike Train service between Toronto and Niagara is provided by GO Transit during the summer months. The 2018 schedule has trains running Victoria Day weekend (May 18-21), all weekends and holiday's from June 22 through to September 3, Labour Day Monday, plus Canadian Thanksgiving weekend (October 5-8). More information on the service is included below. The Toronto-Niagara Seasonal GO Train Service provides service between Toronto's Union Station and Niagara Falls Station, with stops at a number of additional stations including St Catharines. Niagara Falls Station is ideally situated one block from the Niagara River Recreation Trail, a primarily off-road 56km paved path. 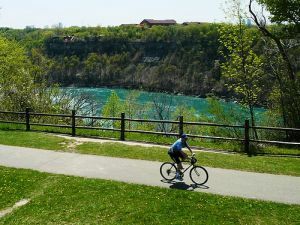 Cycle north on a beautiful 20km ride to see the Niagara Gorge, abundant wineries and historic Niagara-on-the-Lake and explore Niagara's Greenbelt. Cycle south on the path to see the magnificent Niagara Falls, and beyond to Fort Erie. St Catharines station is located a short ride from the city's compact downtown. 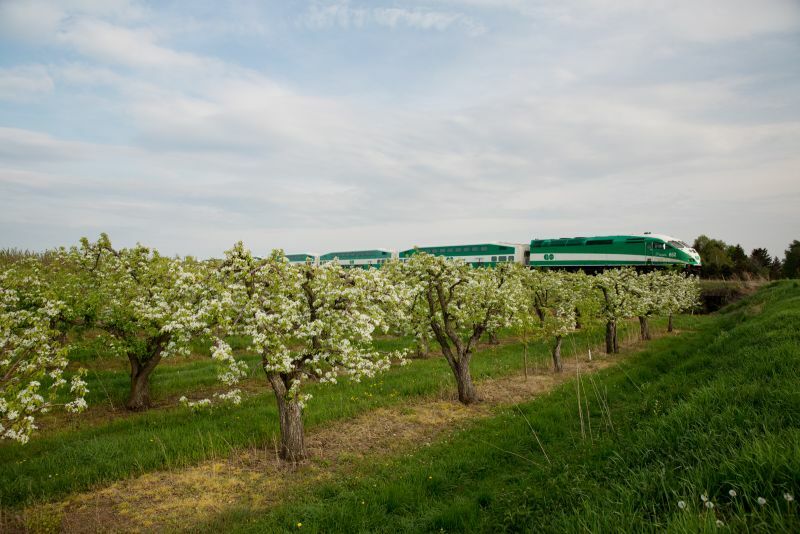 It is also a great starting point to explore Port Dalhousie, the historic Welland Canal, 20 Valley wine routes and mountain biking trails around the Niagara Escarpment and through Greenbelt areas. There are a number of trails and routes to enjoy where ever you stop. We have listed a number of featured itineraries and additional trip planning resources to help plan your Niagara bound trip. By taking Toronto-bound trains cyclists can access Toronto's 1000km Bikeway network and explore the city the best way, by bike. See the Cycling in Toronto page for more Toronto information. 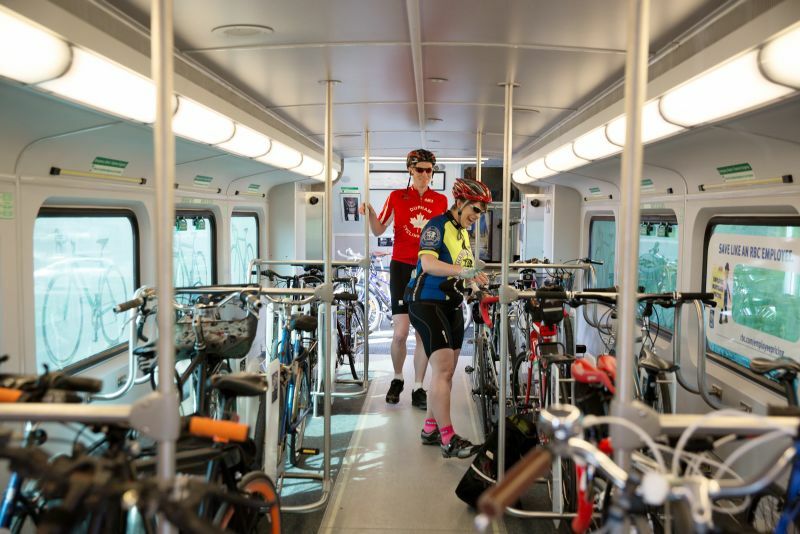 Whether you are cycling one way on the Waterfront Trail, enjoying a trip out with the family or a leisurely pedal within the Greenbelt, the Bike Train can get you to where you want to go. Saturday, Sunday and holiday departures - Special 'bike coaches' with bike racks and space for at least 46 bikes. GO Bus service also available between St Catharines and Niagara-on-the-Lake during summer season, connecting with trains. Bike racks and space for two bikes available on front of all GO buses. Niagara Parks Travel Package - Take the summer GO Train to Niagara Falls, and combine travel with a two-day access to WEGO, the hop-on, hop-off bus service that travels throughout the city of Niagara Falls and Niagara Parks. WEGO has bike racks on front of all buses. Option to add on the Niagara-on-the-Lake bus shuttle and the Niagara Falls Adventure Pass. More travel options than ever now available for cyclists, on summer weekends & holiday services.